A Singing Drummer! I love drummers who can sing. So often they sit behind the band and keep the beat (in many case in spectacular fashion) and rarely do they vocalize. Right away I like this band because Josh Baissari can hit the center of the note and he can drum and he's just adorable. Not since The Stems (raging Dom Mariani fan here) have I enjoyed an Australian band as much. 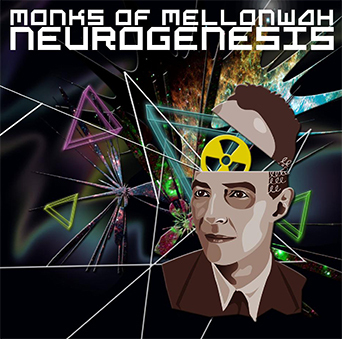 Winner of the award for Best Indie Rock Band at the Artists In Music Awards in Los Angeles and nominated for 3 awards at the LA Music Awards 2012 including Best International Act, the Monks of Mellonwah are a band worth checking out. I wandered off to see their charming "Neverending Spirit" music video and clicked on "Swamp Groove Music" while I was there. That's where I delighted in the singing drummer. Band members are: Vikram Kaushik (vocals), Joe de la Hoyde (backing vocals/guitar), John de la Hoyde (bass) and Josh Baissari (drums). With a sound all their own (though with obvious influences from Pink Floyd) I'm really pleased to have this EP and will be playing it often. The high end harmonies are a little rough on the ears, but the voices in general really are very nice. Vikram Kaushik has clean pipes and a sweet smile and I am crazy about Joe de la Hoyde's guitar. This boy has some sweet licks going on. The band released their first EP in 2010 (how did I miss it!? ), another in 2012 and in 2013…. Here's hoping. Based in Sydney, Australia they nonetheless get around. "Neverending Spirit" has been synced to MTV's "The Real World St. Thomas Ep.9" which aired on August 22, 2012. With their debut album in production, the Monks are building their audience by touring domestically in Australia as well as making preparations to tour the USA in February/March 2013 to support their album release. I sure hope they come up my way. The "Neverending Spirit" music video is on YouTube, along with "Swamp Groove Music". Have a look and then, check 'em out on FaceBook.